Home / Brisbane / What Cosmetic Dentistry Treatments are attracting Brisbane Brides? Most brides and grooms prepare for their special wedding day at least 6 to 12 months in advance. This allows enough time to organise the wedding but also to improve upon their appearance. Some will want to lose or gain weight, others will dare with a new hair style and others will seek to improve their smile with the advice and assistance of a cosmetic dentist in Brisbane. More and more brides today are realising the thing that holds them back the most on their special day is their smile. They are not comfortable laughing or smiling in photos. In fact, most brides will rehearse smiling for days before their wedding so that they can hopefully master a flawless smile in their photos. Other brides insist on reviewing their photos in the digital screen with their photographers on the day to ensure they have the perfect shot. However, this often creates a moment lost or anxiety on the day. Your wedding day should be filled with laughs, smiles, hugs and all things spontaneous. You should live in the moment on that special day because you will realise how fast the day comes and goes. It’s a special time with family and friends and the last thing you want to be concerned about is how your smile will turn out in your photos. Whether you still have an entire year to prepare for your wedding or just a few weeks, Dr. James Malouf and his team can help you fix your teeth and look absolutely radiant on your special day. With significant advances in the field of cosmetic dentistry, you can now have perfectly aligned and sparkling white teeth without undergoing any invasive procedures. So if you’re not photo-ready yet, take a look at our cosmetic surgery offerings and discover how you can improve your smile. If your wedding is still one year or 18 months away, you could consider undergoing a full smile restoration to rebuild and restore damaged teeth in the upper and lower jaw. Full smile restorations are ideal for patients who’ve lost one or more teeth and for those who have severely eroded teeth or fractured teeth. Depending on your needs, Dr. Malouf will either use crowns, dental veneers (porcelain or composite) or dental implants to treat various dental conditions. Dr. Malouf will make a note of cracks in the teeth, chipped teeth, signs of decay, and improper bite and suggest a treatment plan to address these issues. Patients who undergo full smile restoration are left with a smile and healthy natural looking teeth that are both functional and aesthetically appealing. Another great option for those who still have 6-12 months until the wedding day is Invisalign. It’s a wire-free teeth straightening treatment procedure that’s perfect for those who have misaligned teeth. Since Invisalign does not disrupt your visual appearance as wire braces do, you can straighten your teeth without feeling embarrassed. Invisalign is made using clear plastic, so it is discreet and comfortable to wear. No matter what your motivation is to straighten your teeth, Invisalign can make the dream of having a great smile regardless of age or occupation. The dream of having a near perfect smile and straight teeth can be achieved for your special events, whether that be a wedding or to improve your corporate image. Your lifestyle and food choices can have a great impact on your teeth. Stained or discoloured teeth rob you of that perfectly radiant youthful looking smile. To get that brilliant shine you could either opt for the Zoom in-office whitening treatment or the Zoom home teeth-whitening kits. The in-office procedure is quick and efficient. You could even walk in during your lunch break to get whiter teeth. The Zoom home teeth whitening kit comes with custom-made trays and whitening gels. If you prefer whitening your teeth at home and don’t have severely discoloured teeth, this may be a good choice for you. Dr. James Malouf will tell you which treatment options are best suited to you. If you want to brighten your teeth, make sure you undergo treatment at least two weeks before your wedding, so you don’t suffer from any sensitivity. Gum lifts are perfect for those who are held back in confidence by their ‘gummy smiles.’ This procedure contours your gum line which helps to lengthen the look of your teeth. Gum Lifts improve the appearance of your smile. This simple enhancement procedure is carried out using laser technology, so it’s painless and minimally invasive. It leaves you with an even and symmetrical gumline and a more attractive smile. Patients only take 24 – 48 hours to recover from the procedure so you can schedule a gum lift even a week before your big day. 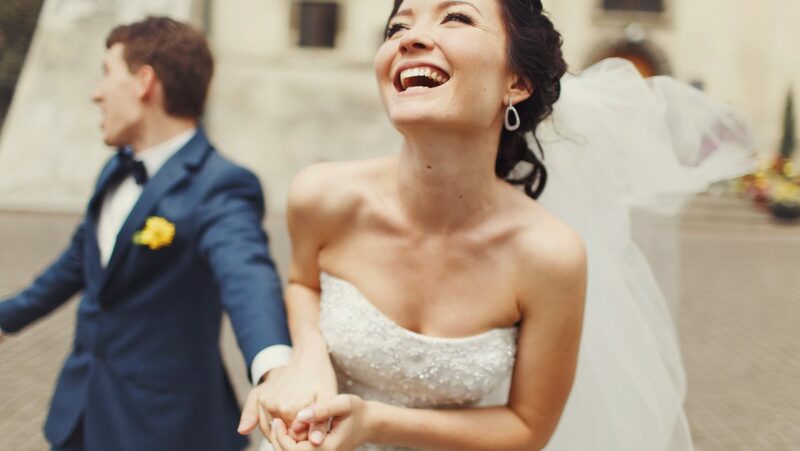 Ready to step into your wedding outfit and wear the brightest smile? Get in touch with Dr. James Malouf. Call us at 07 3177 4829 or visit us online at https://www.cosmeticdentistinbrisbane.com.au.